What is ragweed? Why are ragweed allergies so terrible? While there are quite a few allergens that can ruin a person’s Summer and Fall, not many are as devastating as ragweed. Ragweed pollen hits peak-destruction around mid-September, causes hay fever, and can affect 23 million people in America. So, what exactly is ragweed, and why does it ruin my life for weeks at a time? Ragweed is a North American plant that is in the daisy family. It has tiny green flowers that produce massive amount of pollen. When that pollen comes into contact with a person’s body, sometimes that person’s immune system sees the pollen as a threat. Allergic reactions happen because your body is mistaken about the threat it has come into contact with, and then you get sick. The short answer is not you cannot. I suppose you could stay inside for all of Summer and Fall, but that is very impractical. Ragweed is an overwhelming and relentless allergen for a few reasons. The first being that there are over 17 different species of Ragweed in the country. It has been shown that a SINGLE plant can release one billion grains of pollen in a single season… When you multiply that by the number of ragweed plants there are in the country, the facts clearly show that avoiding ragweed is impossible. The fact that the word ‘weed’ is in the name of the plant should be a clear indicator on how abundantly it grows. 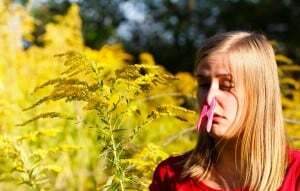 Since avoiding ragweed allergies entirely is not a plausible option, your next best option would be to visit your local ENT for allergy testing a treatment. You never know, you may not even be allergic to ragweed, and it could be something else entirely (This happens more often than you would think). Either way, the only way to get better is to seek treatment from a professional.